While the quote is often misattributed to William Butler Yeats, it was the French surrealist poet Paul Éluard who wrote, “Il y a assurément un autre monde, mais il est dans celui-ci”: There is another world, but it is in this one. It does, however, sound like Yeats, as the quote reinforces the popular view of the grand Celtic poet, the one who celebrates the unseen faerie life, recovering the old stories of the Tuatha dé Danann and the Sidhe. Of course, for Irish poets of the twentieth century, it became a weighty thing, this deep register between the mythic, the landscape, the history, and the poetic voice. And for women Irish poets, an exclusionary thing. 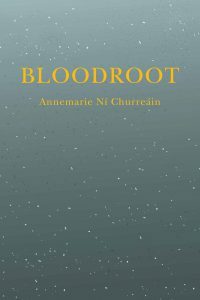 So, to come across Annemarie Ní Churreáin’s first book of poetry, Bloodroot, published by Doire Press, I return to Éluard’s quote. Ní Churreáin is no surrealist, but she does look for the life and lives that have been hidden, removed, erased, lives that still are apparent in this world. She accomplishes this achievement with exquisite craft and unrelenting attention, poem by poem. To find the other world in this one, Ní Churreáin suspends her readers in a tight, liminal space, where we must take great time and care to become still and to reflect, so that we see our own belonging, our own alienation. The poetry happens even before you open the book. First, the title and its sonic qualities: Just two syllables, each ending on a hard consonant, but then that slipknot of “oo,” the short vowel in the first syllable, a hard and ugly thud, and the long open version of it in the second syllable, an open and soaring cry that is clipped short with that stopped “t.” Such dexterous language will pervade each poem once the cover is opened. Second, the title and its possible references: a medicinal flower whose roots ooze a red sap; a single root that is the life force of a plant, like a taproot or a blood feather for a bird; or a root that feeds from blood, or has been drowned in blood. All those associations fill the book. The book is separated into three, tight, distinct sections, thematically united: where the poet traverses familial terrain, and then into troubled (and for me recent) cultural histories of Ireland, and then sojourns into India and Florida. Annemarie Ní Churreáin, a native of the boglands of northwest Donegal, is very much the world citizen, evidenced in her receiving several international fellowships and residencies, including those from the Akademie Schloss Solitude, the Jack Kerouac House, and Hawthornden Castle. The thematic breadth of her poetry is thus hardly surprising. Yet, each poem is discretely fashioned, built on its own sharp and unforgiving terms, in language clear, unfiltered, and yet highly wrought. While I have seen some readers say how they glide through Bloodroot, reading it all in one sitting, I am stunned by the poems. I read one or two an evening, and they trouble me, stay with me. Another one would overwhelm me. or else I’ll tear this House down. or else this House will break your bones. or else we’re all going to burn. Despite its tightly faceted structure, there are slight, slight fissures in the poem, where the “child” and the “bone” are not capitalized, and the brilliant shifting of pronouns in the second line of each couplet: second person, first person singular, third person, and first person plural. The poem’s brevity and simplicity and personified voices also suggest something of the nursery rhyme. And then at the heart of the poem is the urgent and necessary call for witnessing, to tell the story or else. I am left wondering about whether or not we’ll all burn anyway after the telling, after the witnessing. This attention to language partly emanates from the fact that Ní Churreáin is bilingual, a product of a colonized history, and that she is from the hinter boglands of western Ireland. Weighted with the ghosts of her foremothers, to whom the book is dedicated, the simple, hard language is so piercingly employed to speak the truths of the hidden or shamed lives of Irish women, famously the cases of Ann Lovett and Joanne Hayes, two young women in the 1980s who suffered unwanted pregnancies with one resulting in death and the other in pillorying. Ní Churreáin’s is an uncompromising and bold vision: told with a scalded clarity that makes me think of Joan Didion, with a necessity that makes me think of Muriel Rukeyser. But this is all Ní Churreáin, on her own terms. who bend iron, who drive cattle on their own land. cold as medals, streaked with my own blood. Here, the poet unsentimentally faces the world as it is given, “[d]reamless,” while claiming her own agency and asserting her connection to her past, her real, elemental kin. I am leaving out so much accomplishment that is evident in this remarkable book, both in terms of Annemarie Ní Churreáin’s craft and vision. There is much more for any reader to discover. This first book gives promise of a vital, important poet whose voice denudes our convenient illusions. James Brock, the author of four books of poetry and five produced plays, is the recipient of several fellowships, including those from the National Endowment for the Arts and the Florida Division of Cultural Affairs.